You can bring science fiction to life with your own Bluetooth virtual keyboard. Forget those roll-up and miniature tablet keyboards, they’re so 1990s. For real portability, you need a laser keyboard. 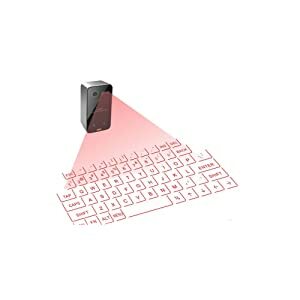 What is a laser projection keyboard? Let’s take a look at some of the best virtual keyboards and you’ll see for yourself. The EPIC from Celluon is a silver and black box that stands under 3 inches tall, 1.5 inches wide, and measures just over half an inch thick. But don’t let its small size deceive you. It casts a full-size QWERTY keyboard onto any opaque surface in front of you. You’ll notice that all the virtual keys are outlined by red light. That’s the laser projection of the keyboard’s template. As we aren’t in on the top secret specifics of how this particular keyboard works, we can only give a general overview. We suspect that there is a sensor embedded in the device, and it may also emit infrared light (which is invisible to humans) too. As you type, your fingers interrupt the light, and the EPIC’s sensor translates those interruptions into keystrokes. Then it communicates what you’re writing over Bluetooth to your phone, tablet, or computer. And that’s all you need to type your homework or browse for cat videos. The EPIC uses Bluetooth version 3.0, so it’s compatible with iPhones, Android and Blackberry smartphones, as well as Windows and Mac computers. Basically, it works with anything that can pair over Bluetooth with a keyboard. As for the best surface to use, transparent glass is a bad idea. 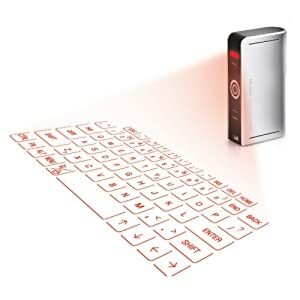 But anything opaque and flat, like a tabletop, a book, or even the floor can become your new “keyboard.” Even cooler, the EPIC virtual keyboard becomes a mouse trackpad with the press of a button if it’s paired with a PC instead of a mobile device. You’ll also be able to adjust its sensitivity, the brightness of the laser light, and the little sounds it emits when you type. Of course, the downside is that you’ll need to remember to charge your keyboard every once in a while. It has a built-in lithium-ion battery that you can refill by plugging in a USB cable. Celluon, in Korea, was one of the first companies to start manufacturing virtual keyboards in 2002. 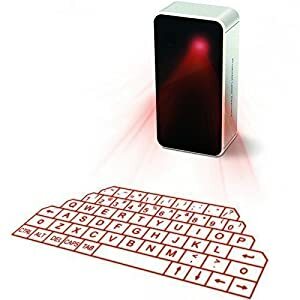 AGS also makes two red laser QWERTY keyboards similar to Celluon’s EPIC. The first model we’re reviewing here has a projection that’s angled toward the top instead of appearing completely rectangular. And the projector itself is thicker and taller than the Celluon model, measuring 4.7 inches tall by 2.8 inches wide by 2 inches thick. This AGS keyboard pairs over Bluetooth v3.0 with practically any device that also has Bluetooth enabled, including PCs with Windows or Mac, as well as tablets and smartphones running iOS and Android. Users are reporting up to three hours of battery life if they use the keyboard continuously. Then it’s simple to charge over USB with your computer or a phone charger. As you type, the device makes a soft beep with each key you “press.” But this sound can be disabled. You can also use the keyboard as a mouse—just press the angled arrow key in the bottom row. We’ve heard a couple of complaints for this AGS laser keyboard. One is that the SHIFT button works like a CAPS LOCK. Another is that the laser is somewhat dim and works best where the ambient light in the room is also dim. As a result of these two issues, the happiest users seem to be the ones who use this keyboard for light-duty with a media center, not as a full-time tool for everyday work. The next AGS laser projection keyboard is quite similar to the last one with regards to function, but it’s quite a bit smaller in size. It measures 2.8 inches tall, 2.8 inches wide, and 2 inches in thickness, making it much easier to transport. But it’s still larger than the EPIC from Celluon. Like the previous two laser keyboards, this device from AGS shines a QWERTY format keyboard onto any opaque, smooth, flat place like a desktop. It’s best to avoid textured or shiny surfaces. But you can pair it with your smartphone, tablet, or your PC, it doesn’t matter as long as both devices can communicate over Bluetooth. Keep in mind that the keyboard, while advertised as full-size, has smaller keys similar to a tablet keyboard. Users with larger hands may find it difficult to use. On the other hand, its laser appears to be stronger and brighter than the previous model by AGS. Q: How fast can I type on a laser keyboard? A: Most laser projection keyboards can handle up to 400 characters per minute. Of course, in reality, your typing speed may be affected by your ability to deal with the smaller-sized keys. And please don’t plan to use one of these for gaming as they may not respond quickly enough. Q: How far away do I need to place the projector from where I want to type? A: We’ve found that most projectors for virtual keyboards only need a little space. You can put most of them just two to three inches away from your keyboard space. Virtual keyboards are a nifty way to transport a versatile input device right in your pocket. If you travel and prefer to have a keyboard with you, a laser projector like one of these won’t take up hardly any space or weight. Visit us again soon for reviews of top tech products and the best gadgets to make your life better.